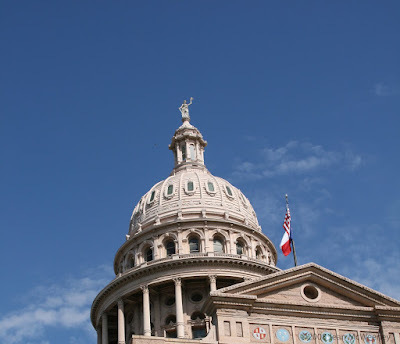 I hope you love Lady Liberty, seen here on the top of the Texas state capitol building. On this important election day, I can't think of a better photo to start my blog with. And it's my birthday! Every so often the presidential election day lands on my birthday. Some days it's been a bit depressing, depending on who wins, but today I'm feeling that my guy's going to do it. Maybe I'll be singing 'Happy Days are here again...' by tomorrow. 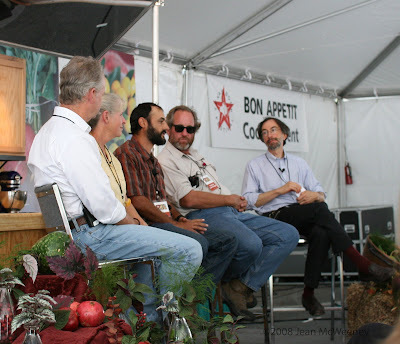 One of the events I attended was about some growers and producers from Texas talking with Corby Kummer (far right), Atlantic Monthly food editor, about their experiences. It was truly awe-inspiring to hear how far in the last two decades the public has come in demanding food that is grown and produced in a sustainable way. Carol Ann Sayle (2nd from left), of Boggy Creek Farm, reminded all of us of how she used to have to explain what organic "was not". I.e., it's not grown with pesticides, not grown with herbicides, etc. Now she explains it, if she indeed even has to, as food grown with a nurturing hand in the soil. Make the soil healthy and your crops will prosper. Corby told the overflow crowd about how the Europeans are jealous of America's farmers' markets. Apparently in Europe the markets are not run by the farmers but rather buyers of produce who select it and then resell it. They're jealous of our direct connection to farmers! I must say, Austin is quite the vortex for all things Sustainable. Even 4 years ago, which is when I moved away, it was still not that common to see restaurants advertise where their raw ingredients came from. Now they have CSA's that deliver to state offices! And many wonderful farmers and ranchers have started to prosper by the proliferation of farmers' markets, chefs partnering with producers, and CSA's ensuring their survival. I was a little jealous and depressed by it all, thinking about how far we have to go in my community. I work with the farmers' market here and right now we're working on educating the producers about growing for their customers, never mind going organic. But as Carol Ann reminded me, even Austin had to grow to get there. So I'm hopeful. Happy Birthday, Jean! And may your guy win if he is the same as my guy. ;-> Probably is. I am jealous also as our farmers have not branched out far from the tomatoes, squash and peppers every single one of them offers. But it is a start. Austin is just a cool all around place. But we are making progress and that's heartening. Speaking as a European, it is not true that farmers markets in Britain are dominated by resellers! There are some, but most traders are small, relatively local businesses. I can buy honey produced 10 miles away, apple juice grown and pressed 100 miles away, butter from 20 miles away, and meat. Farmers markets are a good start, but the really big change is in people growing their own fruit and veg - when I started 10 years ago, I was considered weird as it was traditionally the province of retired men, but now lots of women and younger families are doing it. There are now programmes on TV showing people how, unheard of in the nineties. I grow organically, as do most of the new gardeners and, as you rightly say, people are changing in how they view the production of their food. It takes time, but we're getting there! That's very cool to hear about your markets. (I don't know if you could tell but I was very surprised to hear that comment about the European markets.) Yes, we are getting there.